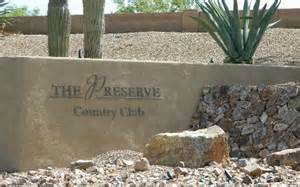 The Preserve at SaddleBrooke is a gated community within SaddleBrooke Tucson AZ. After entering the gated entrance just off SaddlbeBrooke Blvd, there is a long meandering drive of about 4 miles to the Preserve At SaddleBrooke community. The drive winds through the open range on the plateau to the north of SaddleBrooke. As you round the last curve you will see the spectacular setting for this enclave of luxury homes and majestic views. The Preserve At SaddleBrooke offers residents a unique blend of exclusive luxury living in one-of-a-kind location. Home owners start each day with the Catalina Mountain as a backdrop for the their activities. This community offers a quiet and casual lifestyle at the top of the rolling foothills overlooking SaddleBrooke and the valley beyond. As soon as you drive through the understated gated entrance, one becomes aware of the tranquil and quiet surroundings for the area. The setting may mask the active lifestyle that awaits. The Preserve residents have their own country club setting and have access to the amenities of SaddleBrooke. The Golf Club In the Preserve is a focal point for many resident activities. Its southwestern design has an atmosphere of casual elegance punctuated by the panoramic views of the Catalina Mountains. While golf is a big part of the lifestyle, other facilities include swimming, tennis, pickle-ball and dining. In nearby SaddleBrooke there is a performing arts theater, fitness centers, Creative Arts Center, indoor & outdoor pools and whirlpool, tennis courts, softball field and dog park. SaddleBrooke also provides dining at each of its community facilities. If quiet luxury in an unforgettable setting is on short list, then The Preserve At SaddleBrooke may be exactly where you should be looking. The Preserve At SaddleBrooke offers seven home floor plans to choose from. Floor plans range from 2,453 sq ft to 3,485 sq ft. If the lifestyle of the Preserve At SaddleBrooke isn’t enough, all residents of a Robson Resort Community have access to the golf courses at all seven Robson Resort Communities in Arizona and Texas. There will be a fee to play, but at the low resident rate. And if you are considering adult living at its finest, than the Preserve At SaddleBrooke may be exactly what you are looking for. Whether you are want an existing resale or new construction, we can help!